If you would like to view this offline and with everything in Word, here is a link to download the DIY in its entirety: Avin E53 Install Word Doc. First, I accept no liability for any damage or injury caused by attempting this installation. I tried to document as well as possible while still making decent progress on my installation. I may have missed something here or there so use this as a guide as I'm sure it's not perfect. And now that that's out of the way. What I am hopefully going to help you do here is install your new Avin Avant 2 head unit into a factory nav equipped E53 X5. The one in the install is a 2005 4.4i, but this should apply to all flavors of the E53 w/ factory navigation. I also installed the backup camera sold by AvinUSA. I only recommend this for seasoned and skilled installers. It requires a lot of work as the camera is in no way a direct fit for an E53. It took me 8 hours of work to modify and install to a point I was happy with it. I also installed a few other accessories... external mic, external video and USB. Good luck, this is a VERY detailed guide so anyone should be able to pull it off so long as you take your time. 1. 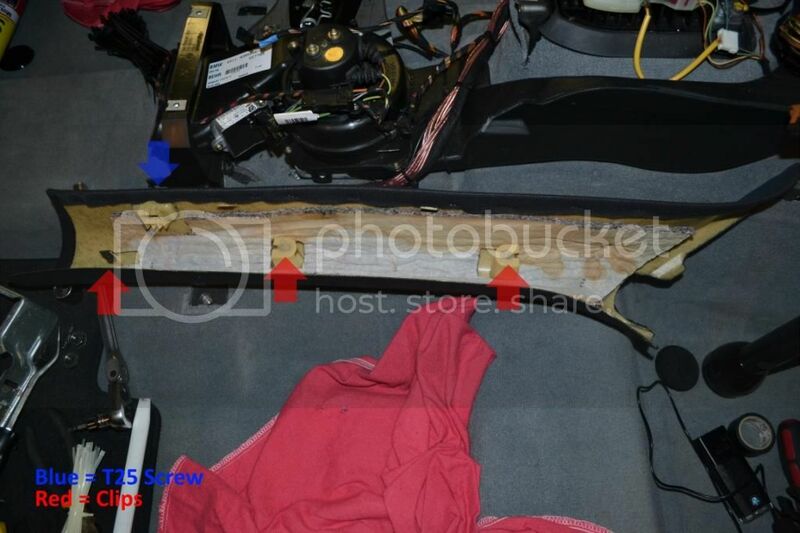 Panel removal tools are handy around BMW's. Pick some up... they are cheap and save a lot of time AvinUSA sells good ones. 2. Soldering iron w/ solder or crimps of your preference. I solder almost everything but it's not everyone's thing I understand. 15. At least a full weekend's worth of time. I took ~40 hours but am extremely OCD when it comes to wiring paths/neatness. I also installed extra accessories which added considerable time (especially the backup cam). 16. Patience - you will definitely need a bunch of it. Take your time and it will be done right the first time. Mine powered up beautifully first try and yours should too. 18. A dremel or similar tool is REQUIRED. 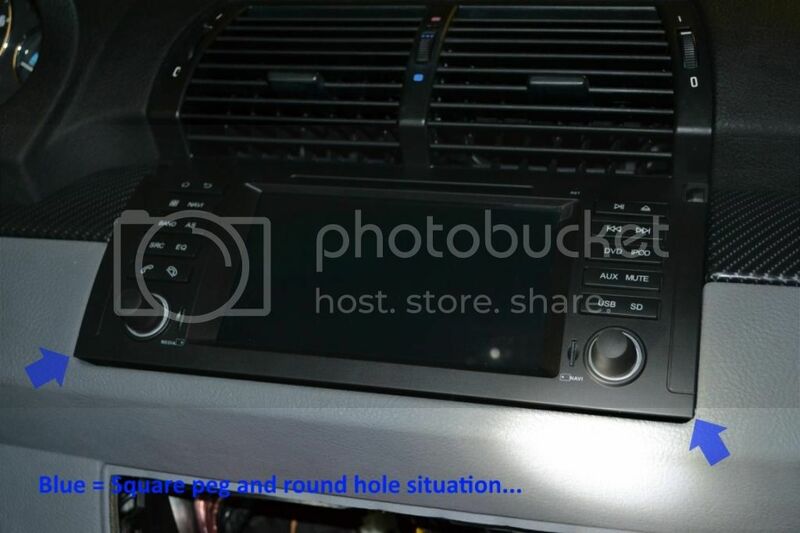 You will see why when the head unit is actually going into the dash. 19. Hot glue gun and silicon gasket maker. I use permaseal black, but others will work. 20. Long "grasp" tool helps a lot for running wires. It has a claw that is retractable and is ~2 feet long. 1. Roll down all 4 windows (provided all your regulators are good). As an experienced installer, it's just a precaution. I have seen far too many installers locked out vehicles. It also gives you better ventilation which is nice. 2. Raise and retract steering wheel in as far as it will go. It gives more clearance to remove the front seats. 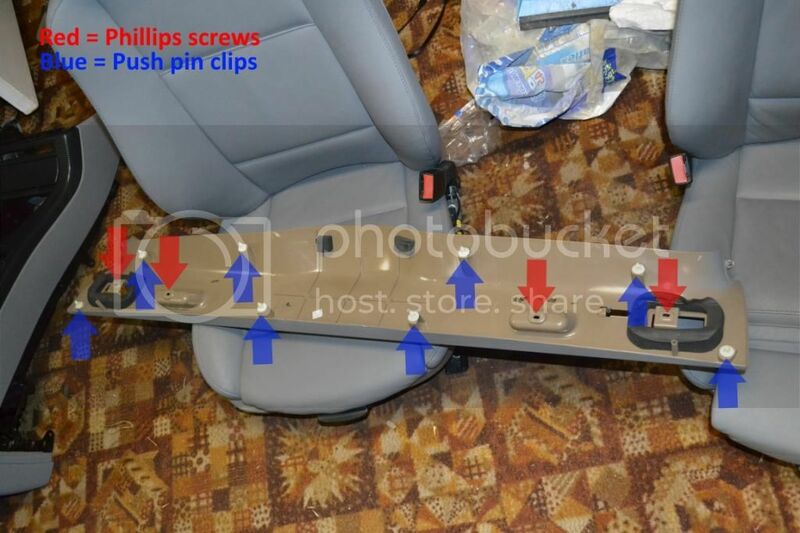 You can do the install without removing the seats, but you will have to follow your own wiring path as mine requires at least the passenger to come out. 3. Move seat backwards in its tracks to access (2) 16mm nuts in the front tracks. They are covered by plastic domes which pop off. Then move seat forwards all the way to access (2) 16mm bolts in the rear seat tracks. Another (1) 16mm bolt secures the front seat belts to the seats. Now lower and center the seats. Also tilt the seat back forward as much as possible. This makes the seats as compact as possible and much easier to remove. DO NOT UNPLUG SEATS YET. You will trip the SRS warning. 4. 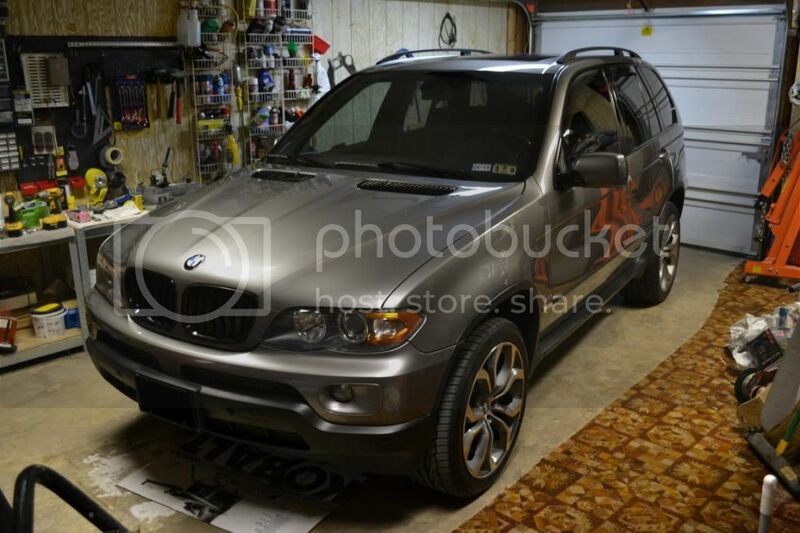 Remove the rear cargo cover and remove the spare tire. 5. Now undo (4) 10mm bolts, (2) 13mm nuts, and (2) 13mm bolts securing air pump (if equipped) and cross braces. Lift air pump housing out of the way... no need to disconnect any air lines or harnesses. Now remove the cross braces. 6. Loosen (1) 10mm nut securing negative battery terminal and remove terminal. Tape terminal with electric tape to prevent accidental contact with loose negative cable. 7. Tilt the front seats back, unplug, and remove. Be careful, they weigh at least 75lbs each. A helper at this point is nice, though I was able to man-handle them out. I have long arms though (I'm 6'8") so YMMV. 8. 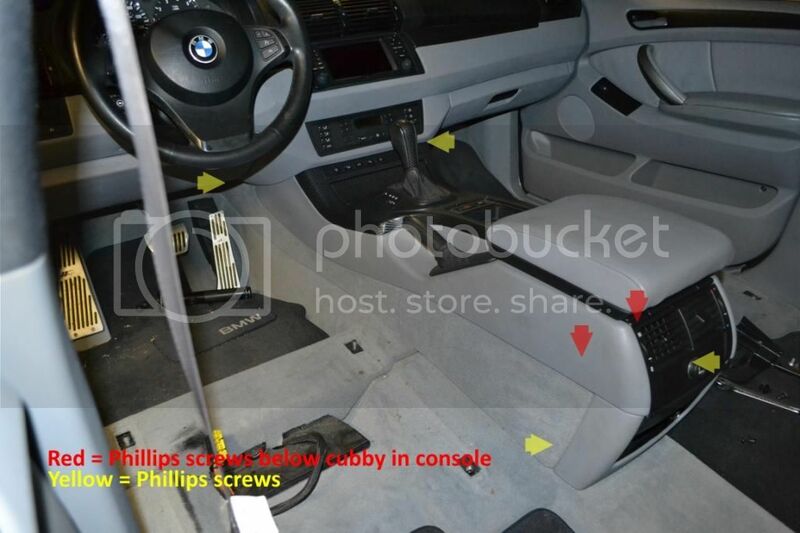 Remove (1) phillips screw from the front of each side of the center console. Then pull out the front carpeted trim panel of each side of the center console working towards the back. There are (3) plastic clips holding it in place. Now remove the rear carpeted section of each side in similar fashion. It is also held in with (3) plastic clips. 9. Open arm rest and pull out plastic cubby insert. Remove the (2) phillips screws from bottom. 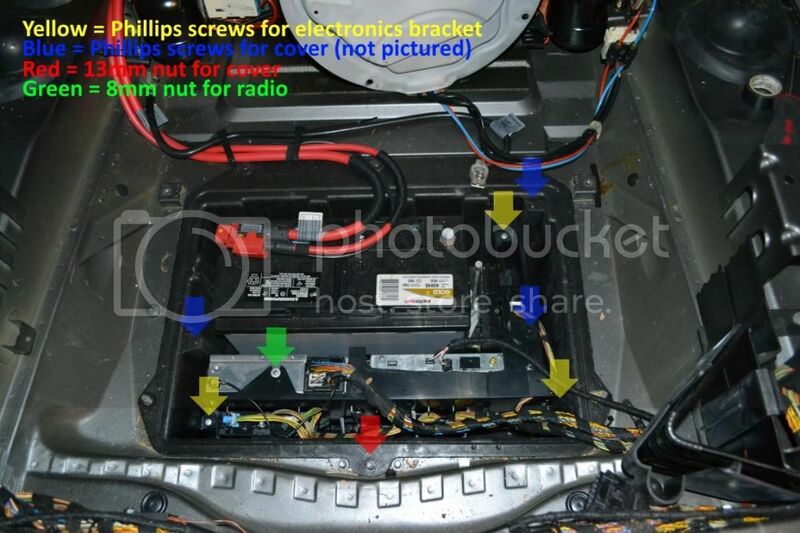 Also remove (1) lowest phillips screws from the bottom rear of the console on each side. Only the bottom most on each side must be removed. 10. Follow up the console another (2) phillips screws per side will need to be removed. 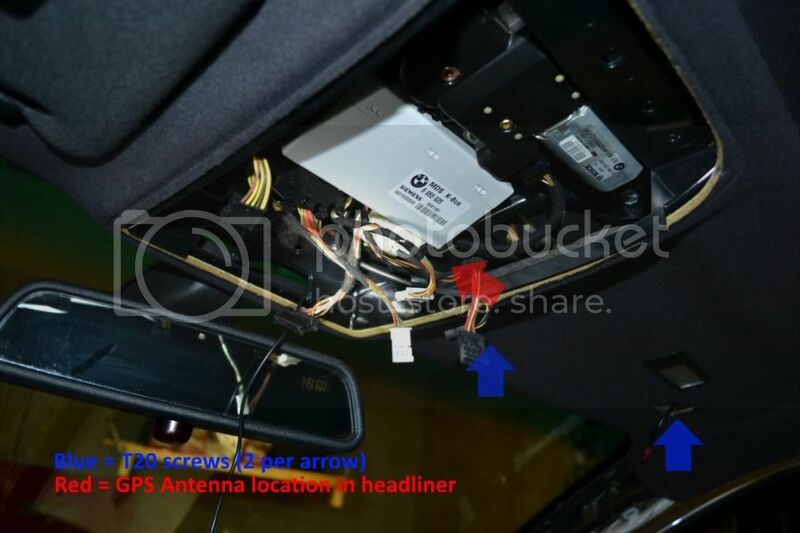 Go ahead and disconnect the antenna cable, cig lighter socket harness, and the 18 pin black harness as well on the driver's side. Note: in my install the metal bracket that is pictured sitting by the E-brake handle will stay mounted just behind the shifter area upon removal. I removed the second screw under the hazard switch mentioned in step 12 so my bracket was loose. 11. 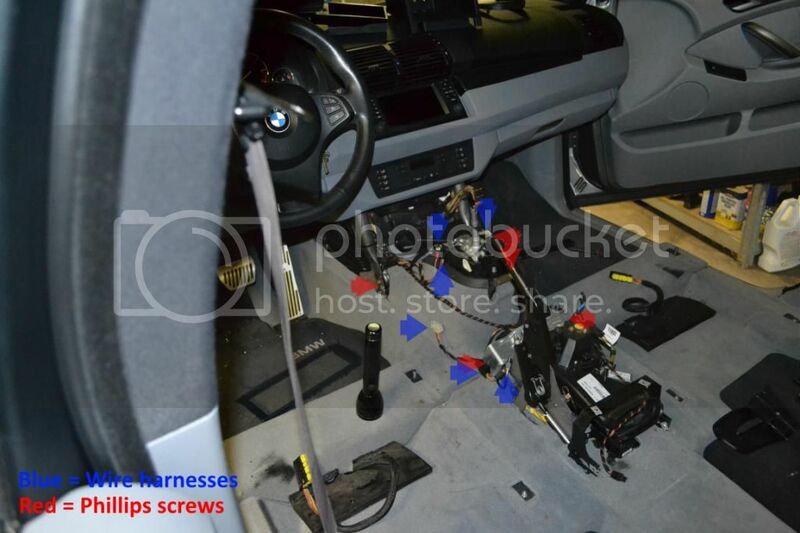 Now remove the shifter handle with the shift boot and pull up the center shift console. Sometimes it is very difficult to pull off the shift knob. Be careful, I've read about people breaking their nose or windshields while doing this. Disconnect the 3 harnesses on the console. 12. Reach through the shifter area and pop out the hazard/lock switch from behind. Disconnect the harness. Remove (1) phillips screw from directly underneath the switch. There are 2 there, only the one directly under the switch need be removed. 13. Disconnect air duct inside storage cubby and remove (2) phillips screws that hold the rear air vents in place. Disconnect 2 harnesses for rear cig lighter/LED and pull out rear vents. 14. Remove parking brake handle after lifting it ALL the way up. The boot pulls out and the handle slides off after that. You need it all the way up in order to clear the console during removal. 15. Step on brake, turn key to position 2, and place the shifter in D or lower. This is also necessary for clearance when lifting the console out. 16. The console is now ready for removal with the exception of the harness for control panel (DSC, PDC, HDC, Seat warmers, etc.) above the ashtray. It is a single harness and can be removed by sliding the console towards the rear slightly and reaching behind to pop out the control panel. 17. If you have someone to help you it couldn't hurt as the center console is a bit unwieldy. Lift the console back while rotating it up to an almost vertical position. Once clear of the E-brake handle and the shifter you can start maneuvering it to one side or the other. Be careful not to mar any of the trim or other surfaces during removal. Cover anything you are worried about with towels or the like. 18. Now we can focus on the rear seats. Pull up on the front of each side of the bottom seat cushion. 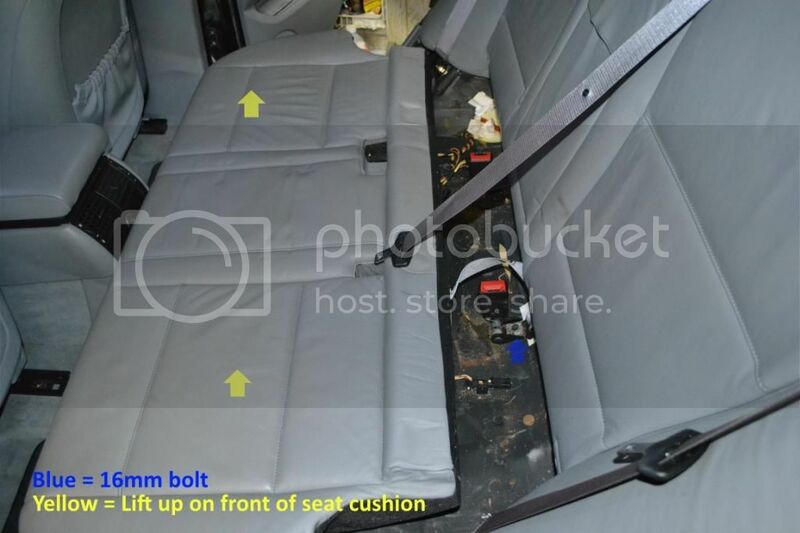 Remove (1) 16mm bolt holding in a seat belt receptacle and remove the bottom cushion. 19. Remove (1) 16mm nut on each side holding rear seat belt anchor in. Remove the rear side cushion bolsters by pulling firmly at the top and then lifting up. It is only held on by a big plastic clip on top and a notch that slides into a metal hoop on bottom. Note: when folding the rear seats flat, put a thick towel over the locking tabs that secured the lower seat portion to avoid marring or tearing the leather. They will dig into the upper seat portion when folded down. 20. 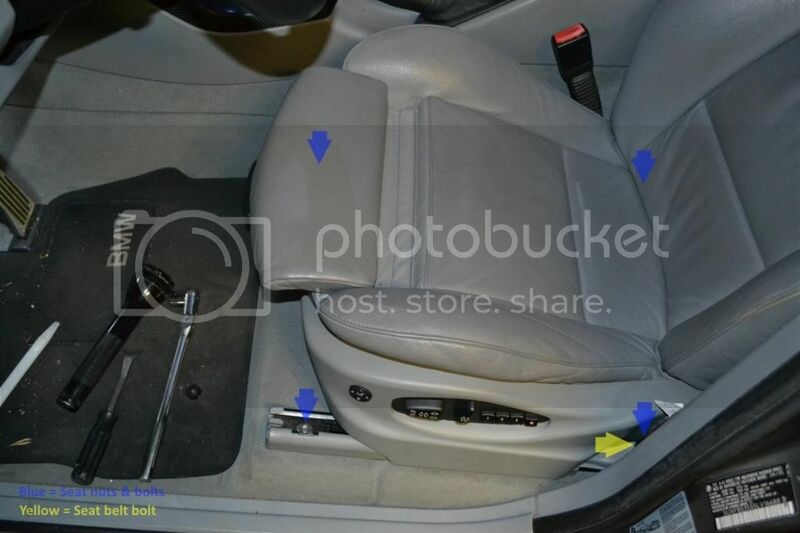 Remove (2) T30 torx bolts from the center of the upper back seat and remove the metal bracket. 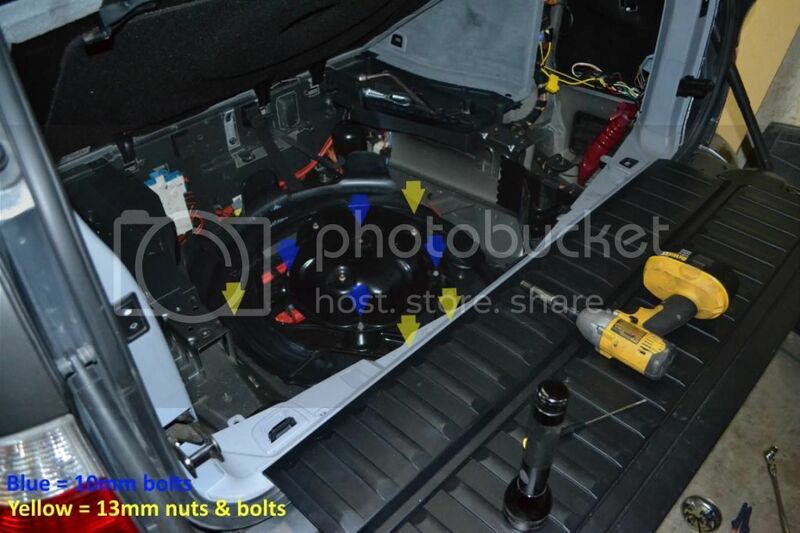 Remove (1) T30 torx bolt from each outer side of the rear seat. There are (2) more bolts (one per side) but they are inaccessible at this point, we will come back to them. Note: I did this on an X5 with power reclining rear seats, your seats may be secured slightly differently. 21. Now move to the cargo area of the vehicle. Remove the storage doors for the cubby and for the factory nav/amp/etc. Remove (3) 4mm allen key bolts from the top of each rear vent panel. 22. 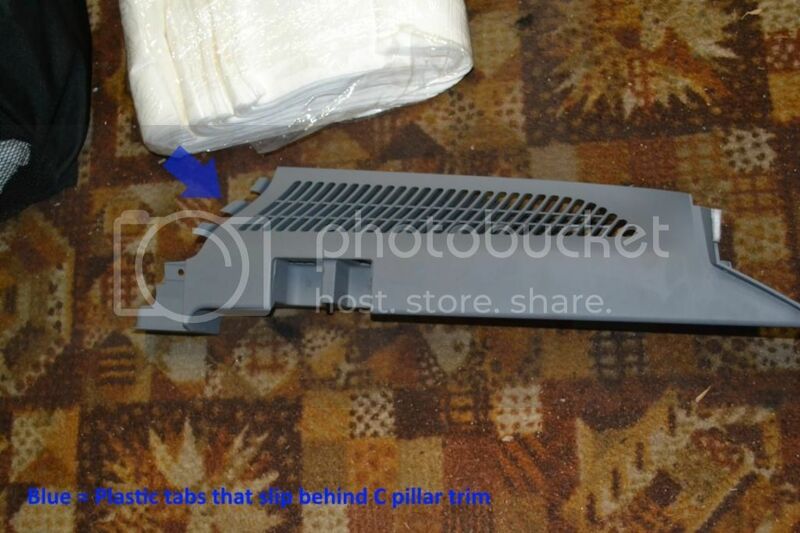 Now remove the (2) plastic phillips screws at the back of the upper rear grey vent panels. I don't believe these are reusable and I had to drill mine out. The heads just snapped off when trying to unscrew them. The rear air vent panel is now loose but cannot be removed until the C pillar is popped out. The rear vent panel has a section that slides under the C pillar. 23. The C pillar is only held on by (2) plastic push pin style clips and (1) push pin at the bottom. Remove the one visible push pin, then remove the door weather stripping that covers the C pillar, and start prying at the bottom. You should be able to see where the clips are through the slit where you removed the weather stripping. 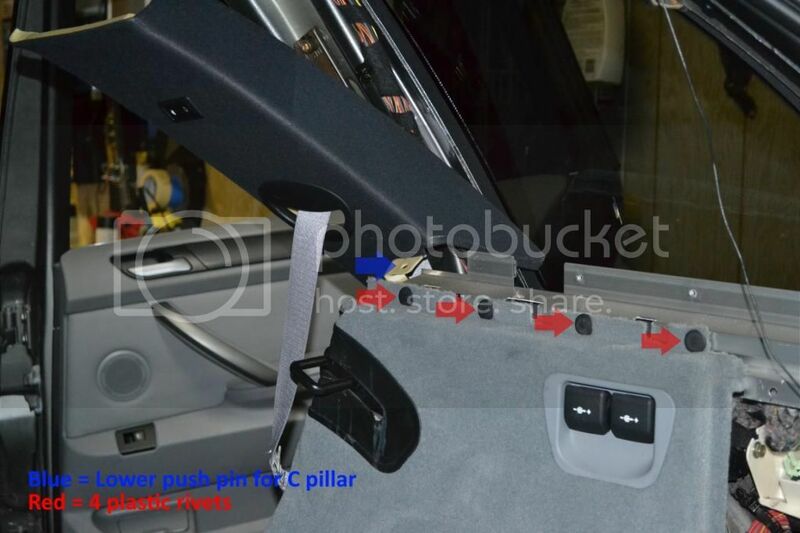 Once you have the C pillars hanging by the rear seat belt you can remove the rear grey air vent panels. 24. To remove the forward cargo cover panels. Remove the (2) phillips bolts holding the tie down anchors in the front of the lower panel shown below. These bolts need to be removed simultaneously or they will get stuck on the anchor. To access them you have to use a pick or small slotted screwdriver to pop out the plastic insert. Now remove (4) plastic rivets from the top of the panels pictured above. These are not reusable. 25. 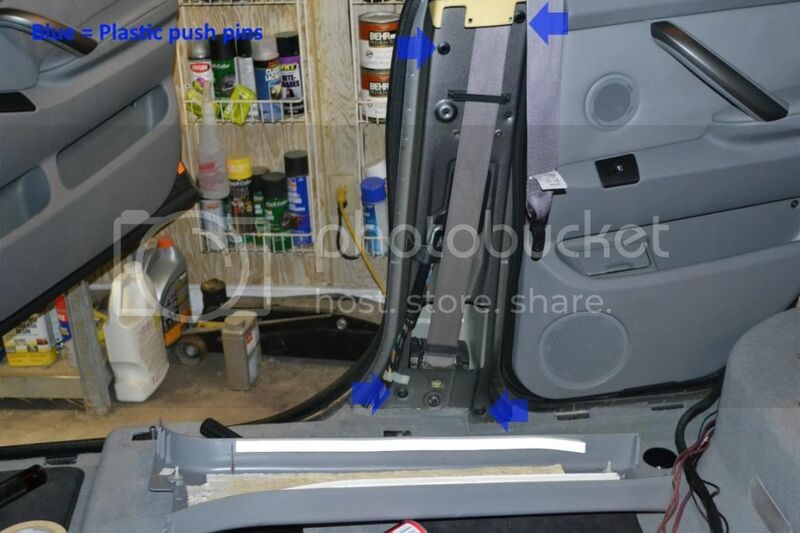 Now you can remove your lower cargo cover floor that has been your comfortable place to sit. Take it out and you can access the last of (3) plastic push pins holding in the lower panels, 2 on the front and 1 in rear. Unplug the (2) power outlets on the passenger side and remove the panels. 26. 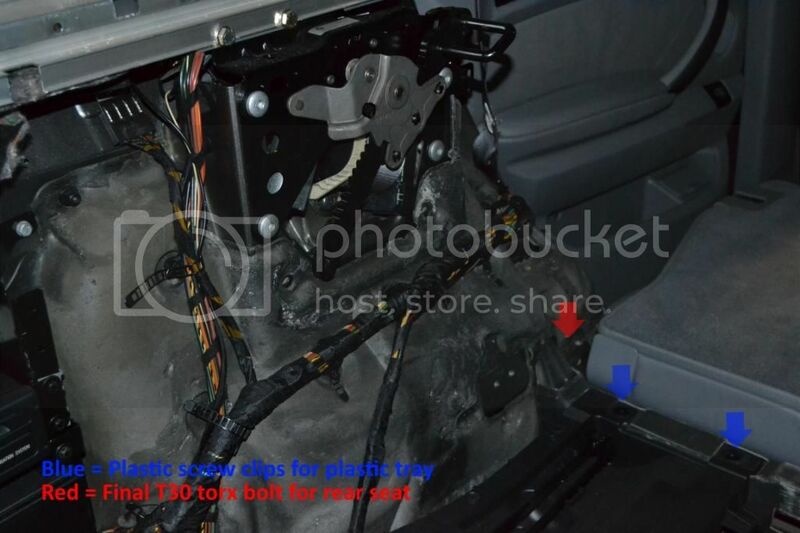 You should now be able to see the final (2) T30 torx bolts holding on the rear seat backs. Remove them and the brackets that secure the seats. You can now lift the seats out of their tracks after folding them flat. The seats split into 2 sections to become more manageable at the middle bracket section. 27. Now remove the (4) plastic trays on each side of the cargo area. 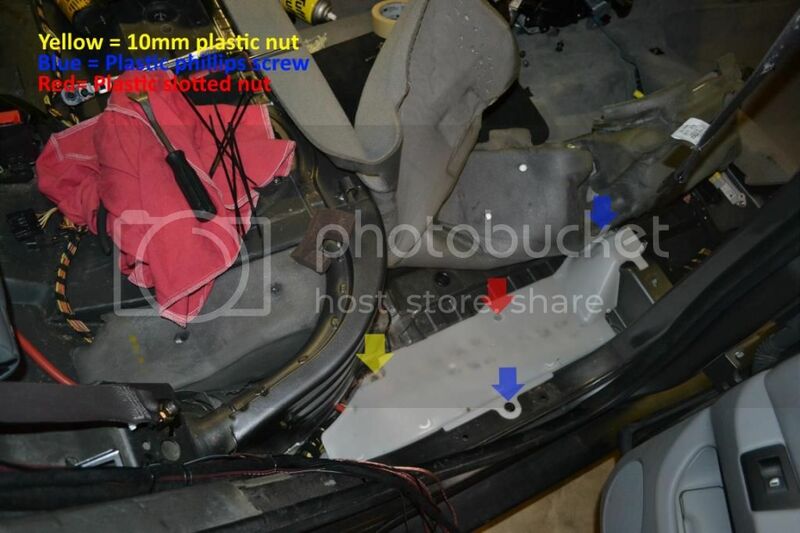 They are held on with (2) plastic screw clip and (2) 10mm plastic nuts on each side of the vehicle. You can also remove the wheel chock bracket at this time by removing another (2) 10mm plastic nuts. This section is only for the brave (foolish) who ordered the e46/e53 rear backup camera at the same time they bought their Avin. If you are installing a different backup camera portions of this will apply to you and others will not. The rear backup camera sold by AvinUSA in no way shape or form fits the e53. Not even close. I hope you are handy with a dremel. This alone took me a day to get a result I was happy with. If you are not installing a rear camera you can skip ahead to the next section (LUCKY). It starts at step 48. 28. Before doing any of the following... test your camera somehow. 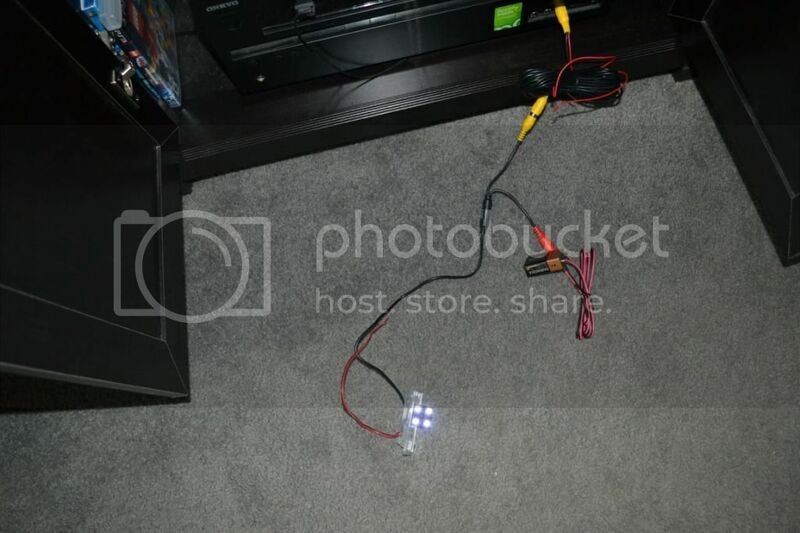 I used a 9V battery to supply power to both the LED lights and the camera itself. I used the video cable supplied and hooked it up to my A/V receiver in the living room to test for full functionality and quality. Bench testing is always a good idea if you have the capability. Eliminating bad parts now is easy compared to later. 29. Remove the portions of the hatch rubber weather seal that cover the D pillars. 30. Remove the bottom trim panel (the one with the spring loaded folding plastic door). There are (8) phillips screws total to accomplish this. (4) on the exposed section, and (4) on the inner underneath the door. 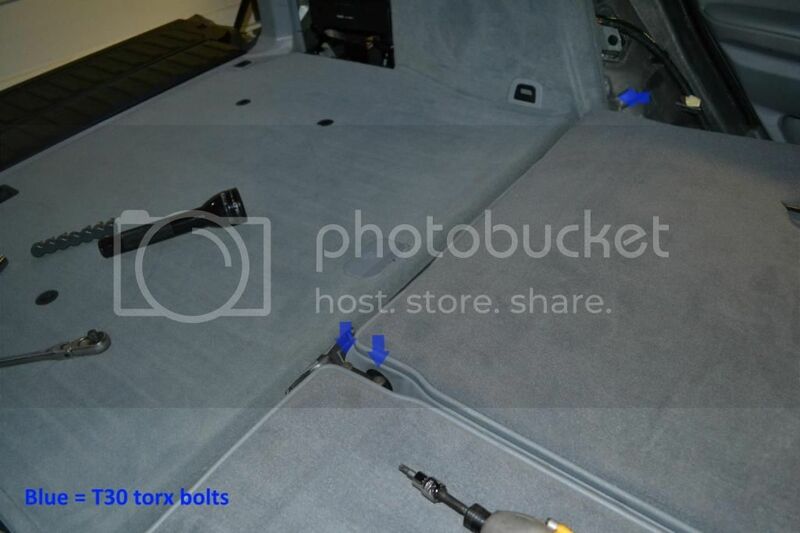 Then remove the cargo tie downs in the same fashion as the ones removed on the front lower carpeted side trims. (2) phillips bolts after popping out the plastic cover. 31. 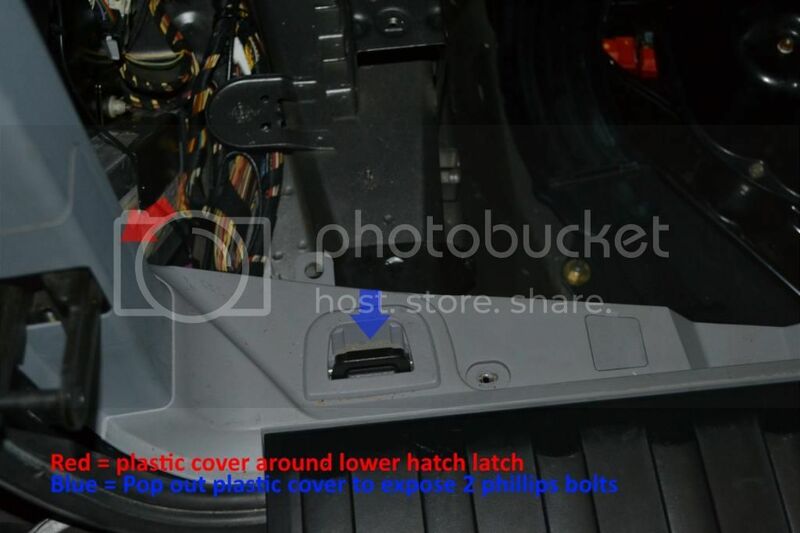 Remove plastic trim pieces from around the lower hatch metal latches shown above. IMPORTANT: before removing your latches, mark their location/orientation somehow. I'm not sure how much fun it would be to align everything again if you were to skip this. You remove the latches by undoing (2) 12mm bolts on each side. Last edited by crystalworks; 07-14-2017 at 08:44 AM. 32. Remove D pillars by undoing (2) phillips screws shown above and then popping it out using a panel removal tool. You can then pop out the rear seat recline switch (if equipped) and unplug it by using a slotted screwdriver to slide up the plug carrier. 33. Now you can remove all the rear lift gate plastic trims. The sides are first and then the rear/bottom. You will most likely break 1 push pin style piece on the side trims. I found this to be unavoidable no matter how careful I was with my prying. YMMV though and hopefully yours comes out with no damage. 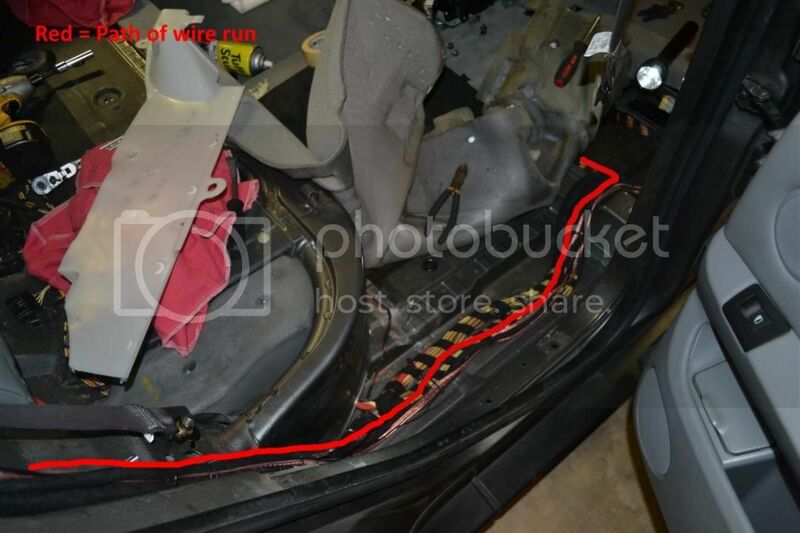 You will need to remove and disconnect the lift gate lights before removing the rear section. Then undo (4) phillips screws and the bottom trim panel will pop off with a series of (8) push pins. 34. Remove the rear license plate light housing by unscrewing (4) T20 torx screws and unplugging the 4 pin connector shown below in step 35. 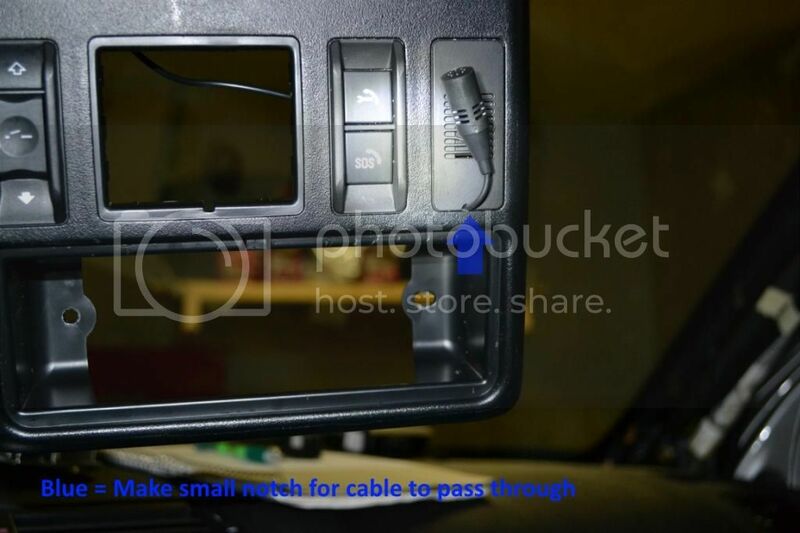 This connector is where you will tap in your new LED light wires on the inside of the lift gate after mounting the camera to the license plate light housing. 35. Break out your dremel as both the factory housing and the new camera need to be modified in order to work together. 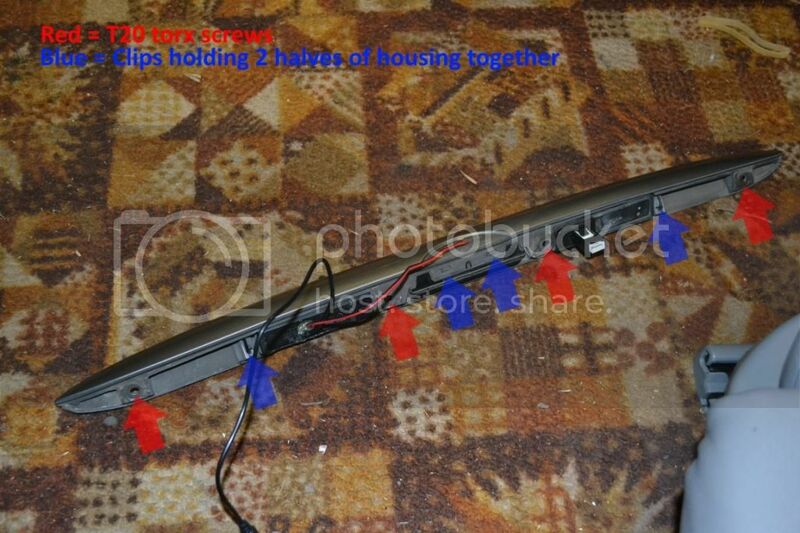 First, disassemble your factory housing by releasing the 4 plastic clips holding the 2 halves together. This can be challenging but is definitely possible using two or three slotted screwdrivers with a plastic panel pry tool. Remove the passenger side lens. 36. 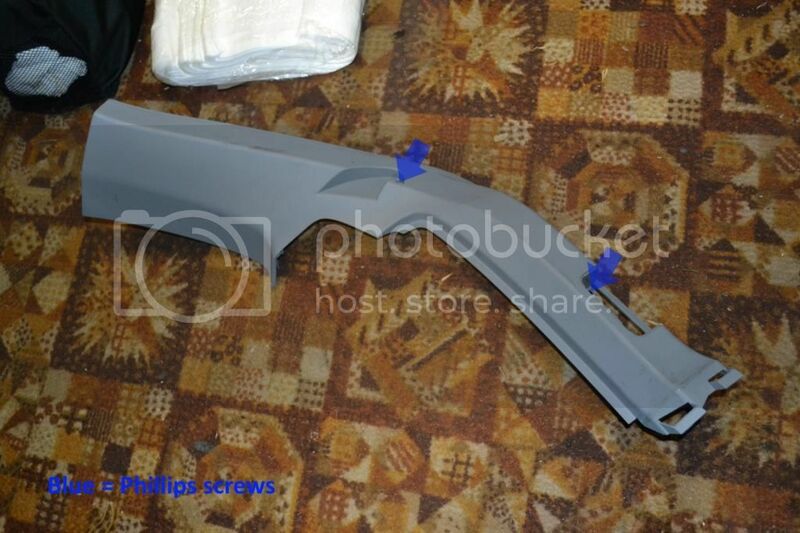 Now cut the passenger side rear of the black plastic section as shown. Try to be as clean as possible as this will make it easier to reassemble and seal later. There are seam lines to follow to aid in ensuring a mostly straight cut. I used a dremel with a cutoff wheel to do mine. Cut is shown in step 37 picture. 37. 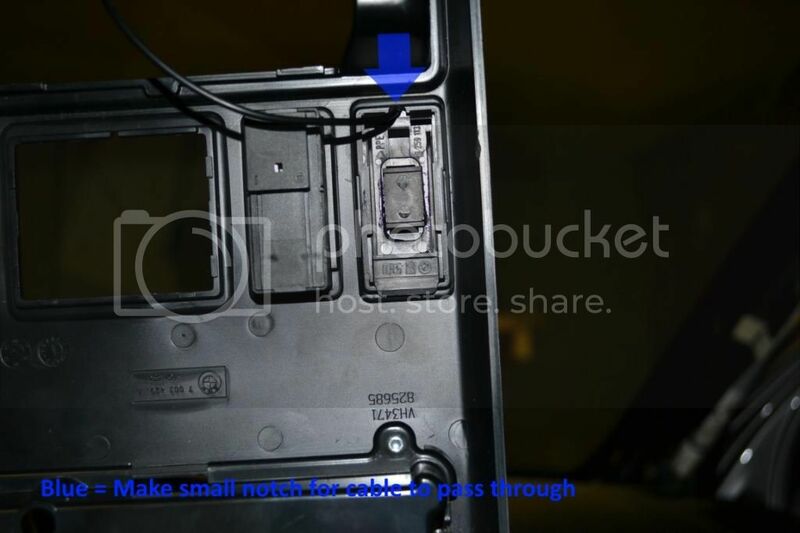 With that section opened up you can see the circuit board that goes through there to hold the light bulbs. This needs to be removed for clearance of the new unit (cut shown above). 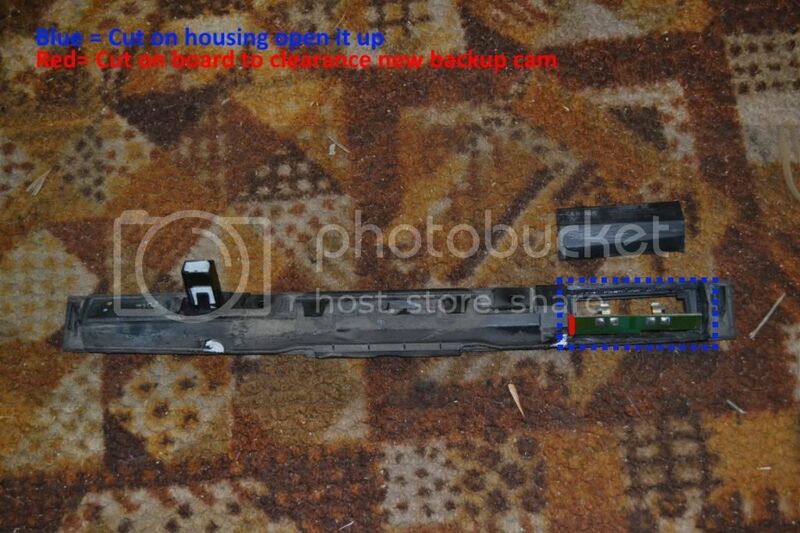 Cut the circuit board as close to your housing cut as possible as you will not need access to it going forward. Don't worry about polarity, I tested all that prior to disassembly and will provide where to tap your new LED leads into later in the guide. 38. Now you have to trim your new camera/lens to fit the factory opening. I cannot tell you exactly how to do this as it involves many test fits, trims, and more test fitting. I will tell you it is a considerable amount of trimming. Unfortunately I did not take a picture of the finished trimmed camera housing but you will see what needs to be done when you test fit it. 39. Once you have it fitting to your satisfaction use hot glue in a couple of areas to hold it in place. This is NOT a permanent mounting solution. Go around your unit with the silicon of your choice (Permaseal in my case) and once it cures will be a permanent mount and sealing solution. Now this does mean it would not be easy to replace the camera should it go bad, so bear that in mind. I ordered it thinking it would be a direct fit... boy was that wrong. I will be imploring AvinUSA to change their item description for this particular camera to reflect that it does not fit the e53. 40. Now drill a hole in the black plastic piece you cut out in step 36 large enough to pass the wires through (shown in step 35 picture). Once that is done you can hot glue (to hold in place) the piece back in place. Just spot glue it in a few places and then go around the whole thing with your silicon to create a permanent bond and seal. Go ahead and also pump the hole where the wires pass through with hot glue to hold and seal those. This is not crucial which is why I only used the hot glue and not the silicon too. 41. Go ahead and extend all the wires coming off the camera now (power, ground, etc) by soldering or crimping additional lengths of wire to them. I chose to trigger my camera (yellow wire on RCA) with the same wire as the power so they were soldered together. Now comes the hardest pill to swallow of the whole camera installation... drilling a hole into your lift gate. You need to pass the wires through into the lift gate just like the factory does it on the driver's side with a square hole. 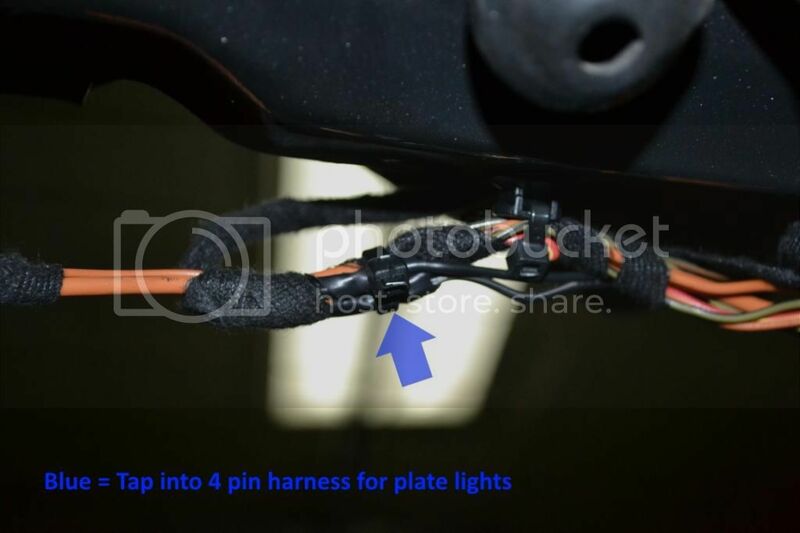 I went over and over this to see if there was a way to run wires through the license plate light holder in order to utilize the factory hole... short answer, there is no easy way to do this. It's easier to just drill the hole. Make it just big enough for the wires to pass (video wire is the largest to accommodate, insert it first). Put some paint (touch up paint works great), silicon, or grease on the metal to prevent any corrosion. 42. 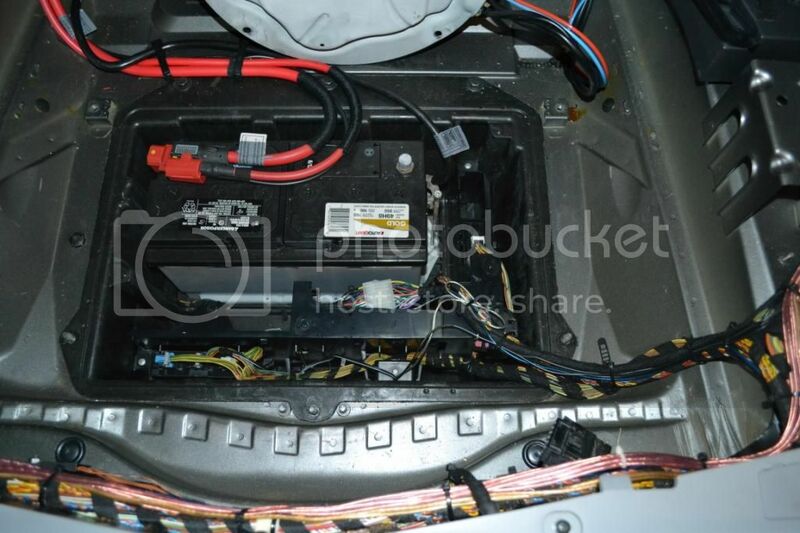 Plug all your wires into the camera and run them to the passenger side, there are 2 holes there for the wires to pass out of the rear compartment. You will notice that I use heat shrink over all my RCA connections and any connection really that can be pulled apart. This ensures no accidental disconnection is going to happen during install, or further down the road. Sorry, I don't have a picture of the drilled hole but can get one and revise this if requested. 43. Go ahead and reinstall the rear license plate housing now (4) T20 torx screws while pulling the excess wire slack through at the same time. Run only the 2 wires you extended for the license plate lights over to the 4 pin harness (X1739) that supplies the OEM license plate lights. 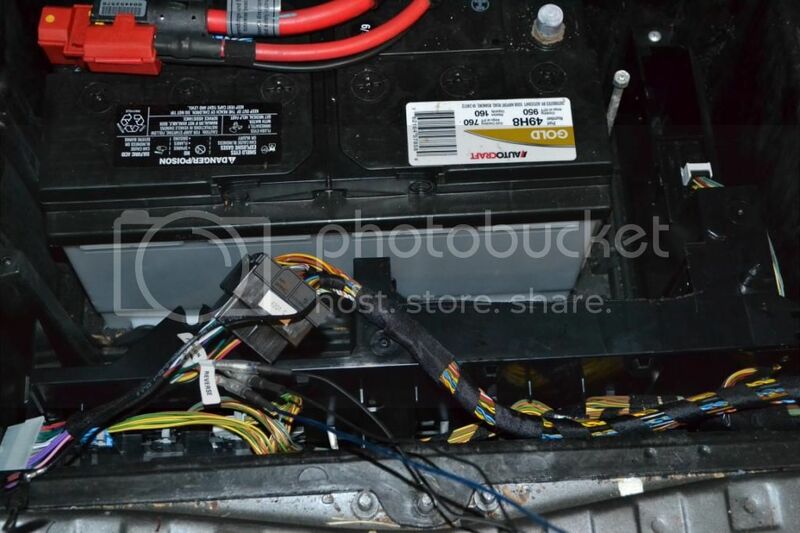 The wires you want to tap are: brown (ground) and Green/Orange (+12v to passenger side plate light). 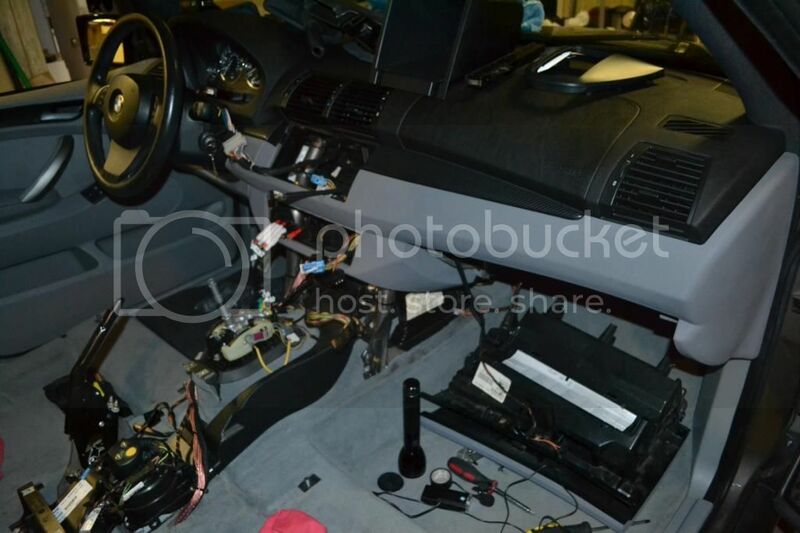 Secure all your wires to the OEM harnesses. 44. 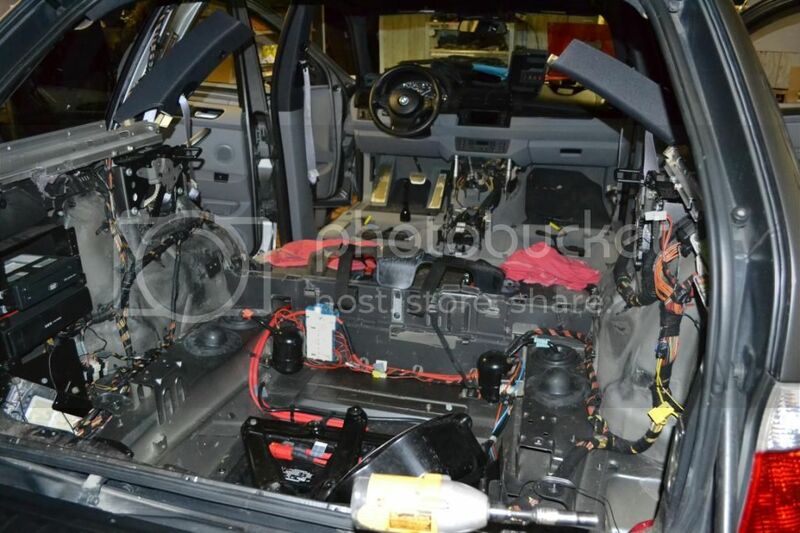 Now you have power/ground for the camera and the video signal wire to pass along the passenger side harness to the rubber "snake" grommet that goes from the lift gate to the body of the vehicle. You will most likely have to cut the video signal RCA (I re-soldered/insulated it later) in order to fit it through the grommet. I accomplished this task by using a combination of a long zip tie that I could tape my wires to and pull through the grommet and a long "grasp" tool that can be inserted in one direction and then pulled back out with the grasper on the new wires. 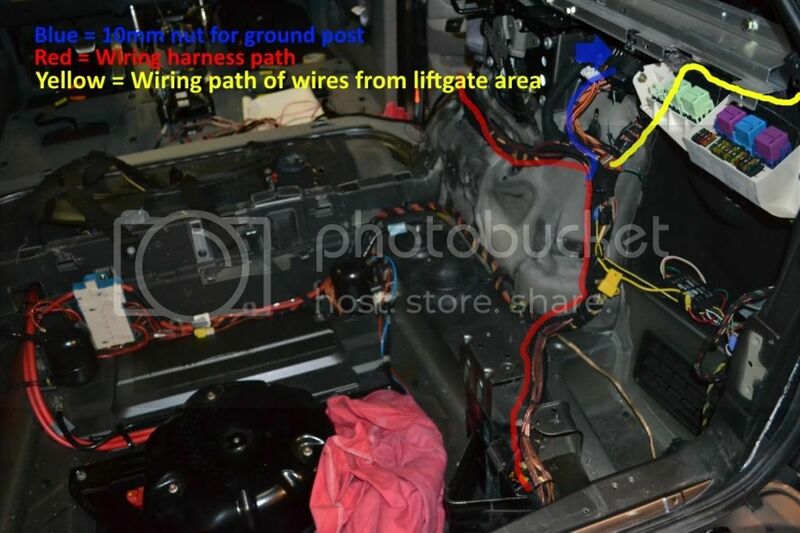 The wiring path is shown in image from previous step. 45. 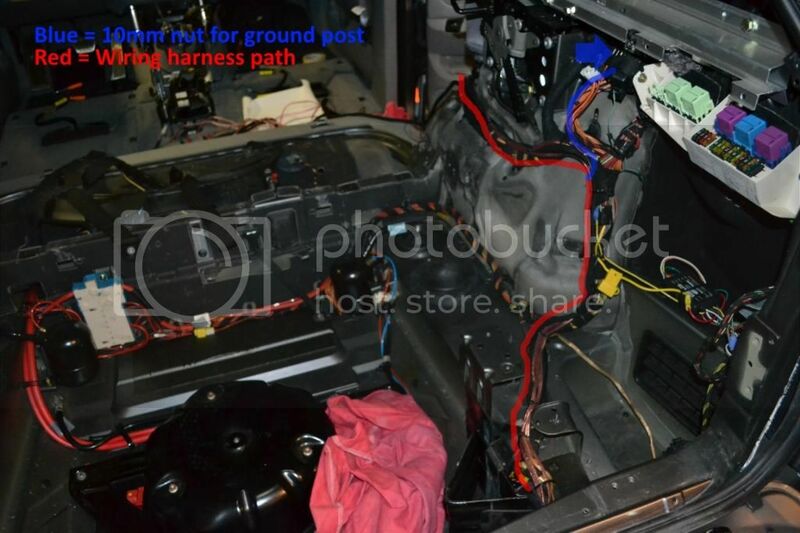 Once you have the wires through the factory grommet and into the vehicle you can run it down along the D pillar area until you get to the fuse box area. At this point you will see a factory ground point (pictured in step 53 image) in front of the fuse box area. Run your wires along the factory harness behind the fuse box and secure with zip ties. Go ahead and separate the positive wire for the camera (we'll come back to it later) from the negative wire at this point. Cut the negative wire to reach the factory ground point with 3-4 inches of extra length. Don't terminate it yet. I grounded the parking wire (for video in motion) to this location as well, just in case it was necessary. I have read you don't need to use the parking wire, but I used it anyway and soldered both wires to a ring terminal and installed them along with the factory grounds. Your yellow RCA will join your main cable run to the front here (shown in red below). 46. Go ahead and reinstall all of your lift gate trims. We are done back there. Install rear section first (4) phillips screws and pops into place. Then install the 2 sides using a series of push clips. Reinstall the lift gate courtesy lights and emergency hatch release plastic pull. 47. 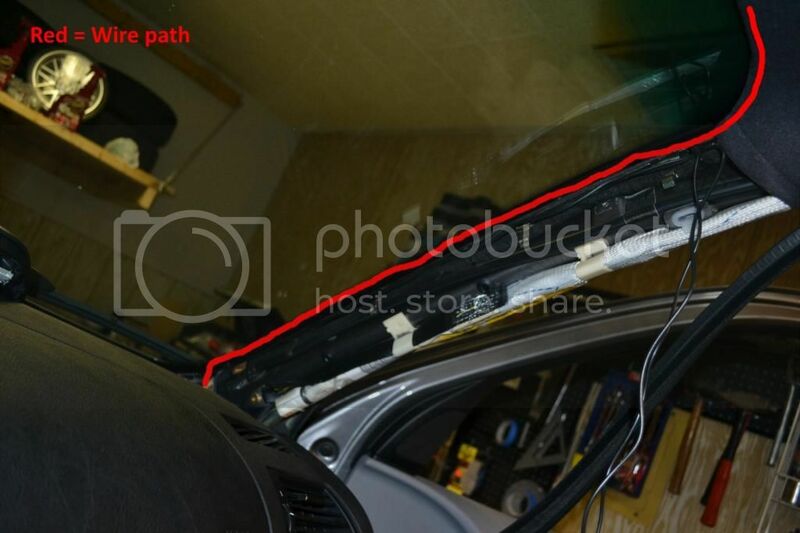 This step will have sub-steps and involve the creation of a control "circuit" for the backup camera. There are easier ways to do this using a standard bosch 5 pin style relay and triggering it with the backup lights. This is not your average DIY though so I am going to show you a cooler way which I cannot take credit for. Thanks to TerminatorX5 for the legwork/info and Smokey53 (both from Xoutpost) for the nudge in this direction. What we are doing is making a simple control circuit so that the factory Park Distance Control system controls the rear camera like a factory setup would. Manual control is possible as well utilizing the factory PDC switch. a) From Radio Shack you will need model #275-241 micro relay. 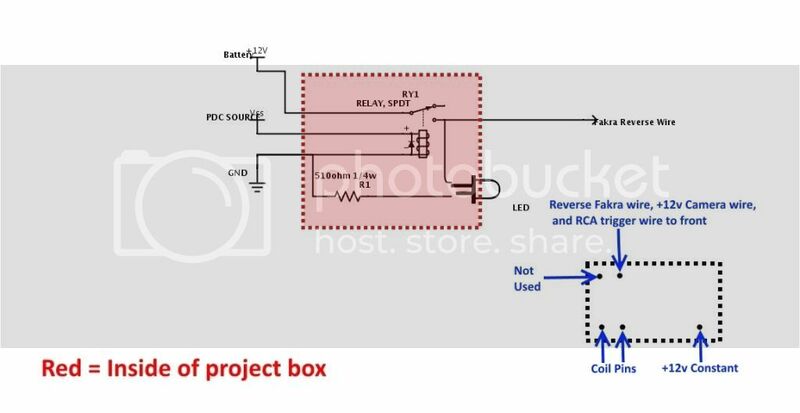 You will also need project box model #270-1801 to house the circuit. You can also buy the bread board from radio shack as well but will have to trim it to fit the box. You won't need much. Solder/soldering iron are also a must for this mod. If you don't have extra wire lying around, buy some 18 gauge speaker wire as well. Get some in different colors as you will have 4 wires coming out of the box you need to distinguish. b) First thing you will need to do is trim up your bread board to fit inside the project box. I used a dremel to cut some and get it to fit in there. You can use the 4 mounting locations to secure it to the box, but unfortunately these screws are not included so you will have to pick some up or use some from a stash you have like I did. c) Now, plan out where you are going to mount all of your components. You can use my picture as a guide if you want. This is probably not the best layout for the circuit but works fine. I put a diagnosis LED on there with a resistor but you can skip this. I had a bunch of red LEDs lying around and thought it would be nice if the circuit would tell me if it is in use. Omit the connections from the LED if not using one. d)The diagram for this circuit is below, and a pinout for the relay to make things easier to understand. Solder up your board accordingly. As I said you can skip the LED/resistor combo if you like. It is not necessary to the circuit. After you are done, you can test the circuit using a 9v battery and multimeter just to make sure you have everything good to go before putting it in the vehicle. e) You should be left with 4 wires coming out of the project box. The NC pin (normally closed) will not be used for anything. The 2 coil wires (represented by coiled lines on the package diagram the relay came in) are for PDC reference source (pin 7 Brown/White or Brown/Yellow wire) and for ground (pin 6 ) coming off the PDC module's second (Black X300 plug) harness. It doesn't matter which side of the coil is for which... it doesn't care about polarity so solder it whichever way makes building the rest of the circuit easier. 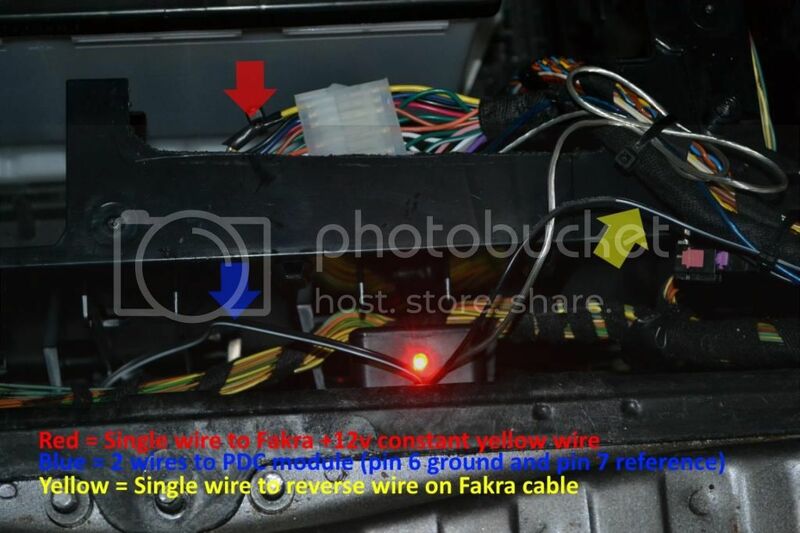 12v (battery) constant can be pulled from the Fakra yellow wire (silver wire coming out of box shown below). 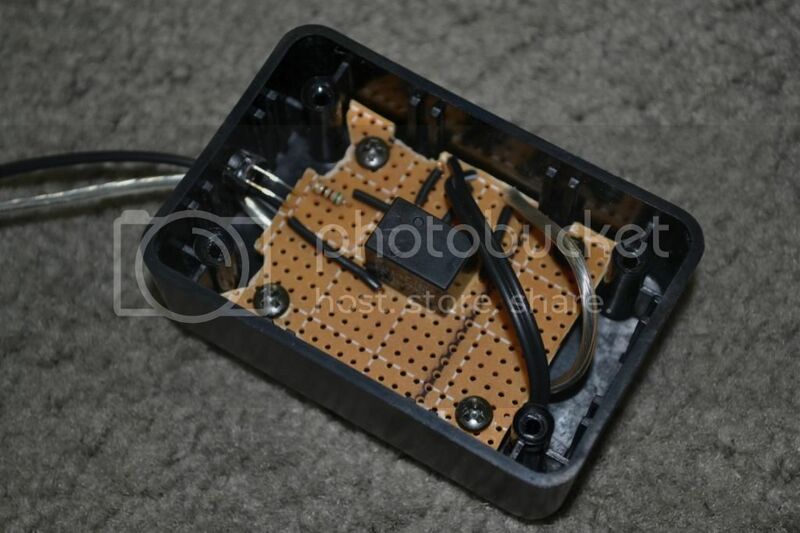 The final wire coming out of the project box is the NO (normally open pin) and goes to the Fakra reverse input wire. This is the wire that gets switched to 12v when the PDC is turned on... either by the car or by you with the button. You also need to tie your camera positive wire (that was left from step 45) AND your yellow RCA trigger wire to this wire. If you are using the same setup as me it means you have to run an additional small gauge wire along with your yellow RCA wire all the way to the front of the car. If you are using a trigger wire separate from your RCA video wire you can skip running the extra wire. Your new control box can easily be tucked with the rest of the modules in the tray as shown below. The module on the left with the 3 plugs is the PDC module. I realize that all of that might be hard to understand and sound daunting, but if you follow the diagram and instructions it's not too bad. It took me 20 times longer to write it than to do it. 48. To access the factory radio unit (the actual radio, not the screen) we need to remove the plastic cover around the battery: (1) 13mm nut and (3) phillips screws. Now remove (4) phillips screws to remove the module/electronics bracket. Loosen (1) 8mm nut and you can remove the factory radio from the bracket. 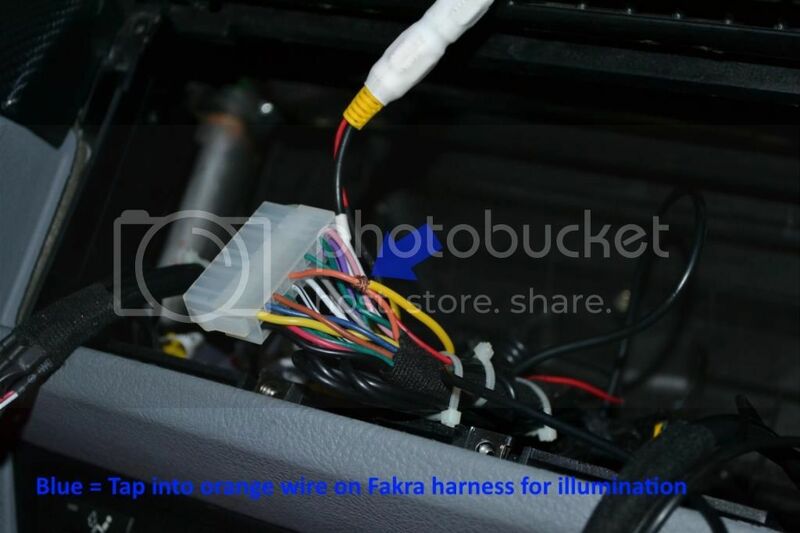 Go ahead and connect your Avin Fakra cable to the radio harness. 49. There are 3 wires coming off the Fakra that need to be addressed: parking, reverse, and amp continuous. If you are not planning on installing aftermarket amplifiers in the future you can disregard the amp cont. I have READ that you can disregard the parking wire as well. I went ahead and grounded it just to be on the safe side. The reverse wire was addressed in step 47 and comes from the control circuit. All of these connect using wires soldered to appropriately sized bullet style connectors. 50. Now is the time to decide if you are running any additional accessories in the future. I ran 3 pairs of RCA's and a remote wire for future audio upgrades (the copper colored wires shown after step 53). These RCAs have to go from the factory amp location (in my case) all the way to the front of the truck and I didn't want to have to pull it apart again in the future. 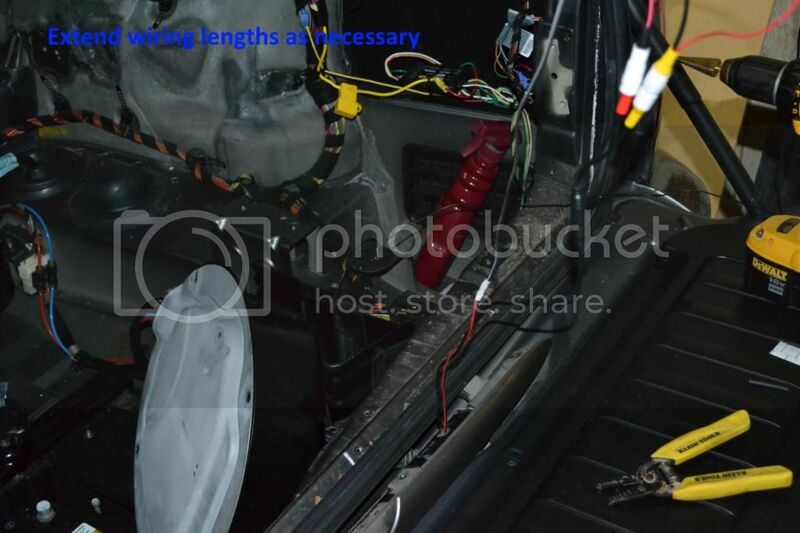 BTW, I chose the run the wiring down the passenger side of the vehicle to avoid any interference from the main +12v cables that run along the driver's side in my wiring. Also you can remove your factory nav drive/computer and anything else at this time. 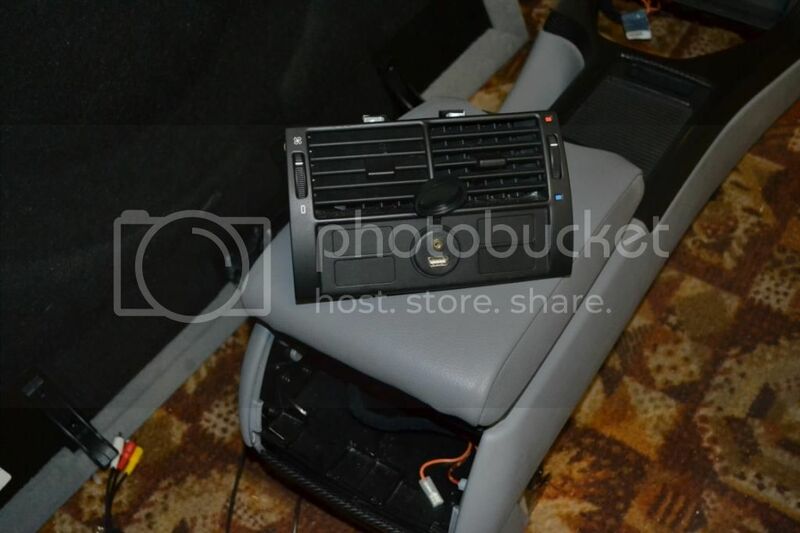 I removed the Mark IV, CD changer, Bluetooth, and Sirius modules. In the future I'll remove the factory amp and brackets as well. Removal of these is fairly self-explanatory using mostly 10mm bolts. 51. Vacuum everything now before wiring starts and any trims go back in. It's nice to remove a decade (or more) of dust and debris now while everything is accessible. Wipe everything down with a damp towel as well for a nice factory fresh look. Go ahead and re-secure the electronics/module bracket (4) phillips screws. 52. Connect your Fakra extension cable and antenna extension wire. Now run all your added wires out of module area following the factory harness. Secure your wiring along the factory harness every 6 inches or so as necessary. I ran my parking wire up the factory wiring to the fuse box area and soldered it with the camera ground to a ring terminal and installed on the ground post (10mm nut) in the fuse box area shown by the blue line after step 53. 53. Keep following the factory wiring up and over the wheel well area, behind the rear cushion bolster area, and down to where it disappears under the carpet. Keep all you wiring zip tied and neat so you won't have any problems reinstalling any trims or risk crimping/shorting a wire. Now you can go ahead and reinstall the rear trimming up to the rear seat backs in the reverse order they were removed. Don't install the battery cover bars or air pump yet. DO NOT connect negative battery terminal yet. 54. 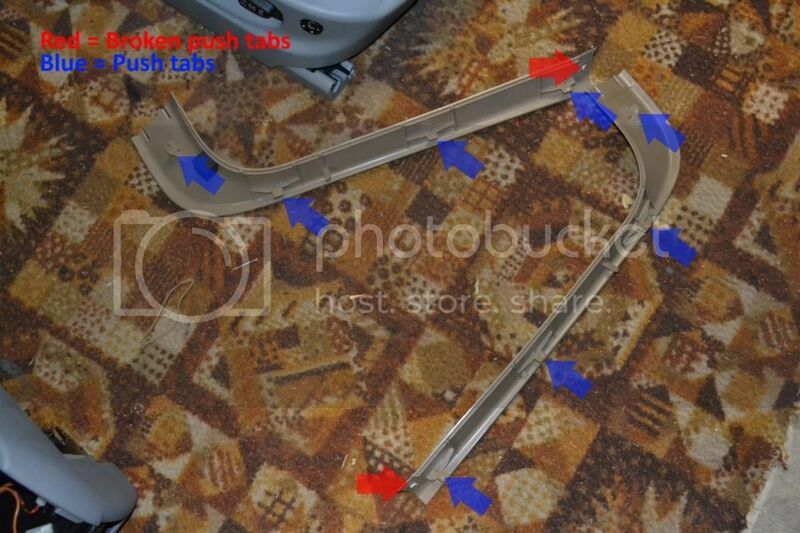 Remove the front and rear door sill trims. (3) Push pins for rear and (5) push pins for front door sills. 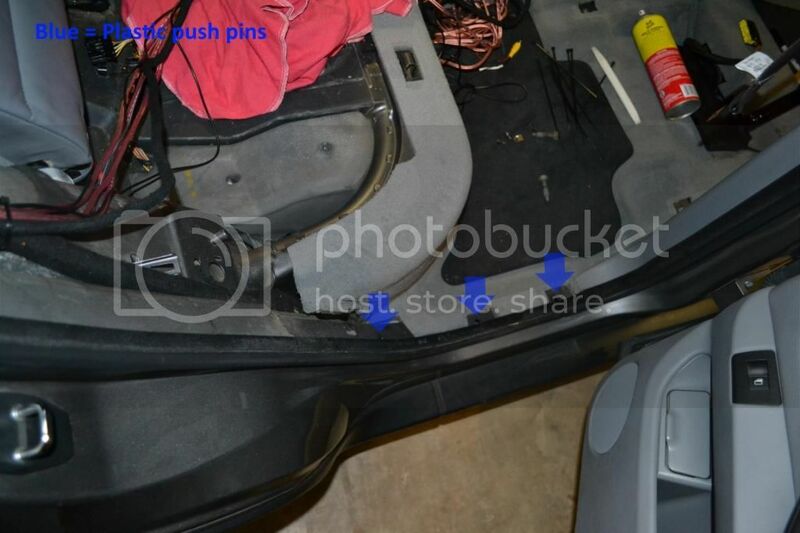 Now remove the B pillar by pulling out door weather seals and prying from bottom first (4) push pins. You can now pull the carpet to expose factory wiring trays and covers. 55. Remove the plastic wire cover: (2) T20 plastic screws, (1) slotted plastic nut, and (1) 10mm plastic nut shown above. Route your wiring along the factory paths up until it splits and heads towards the center console. 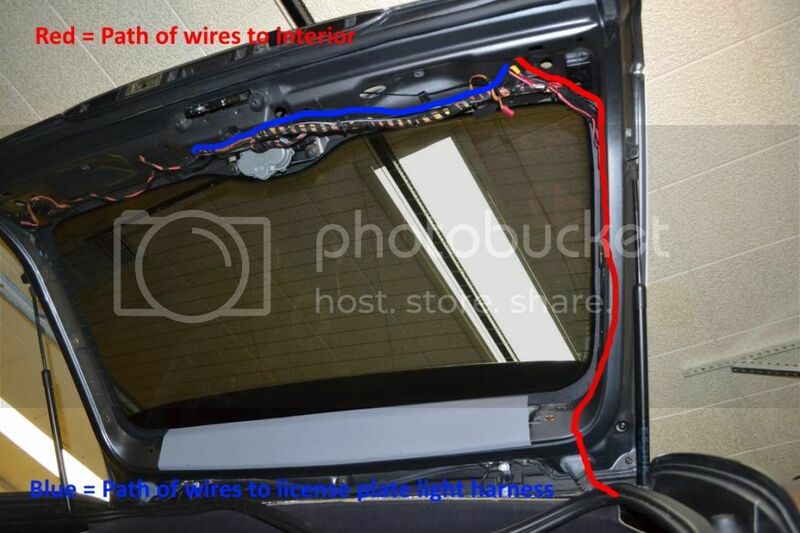 Follow the wiring towards the center console, not the front of the vehicle. 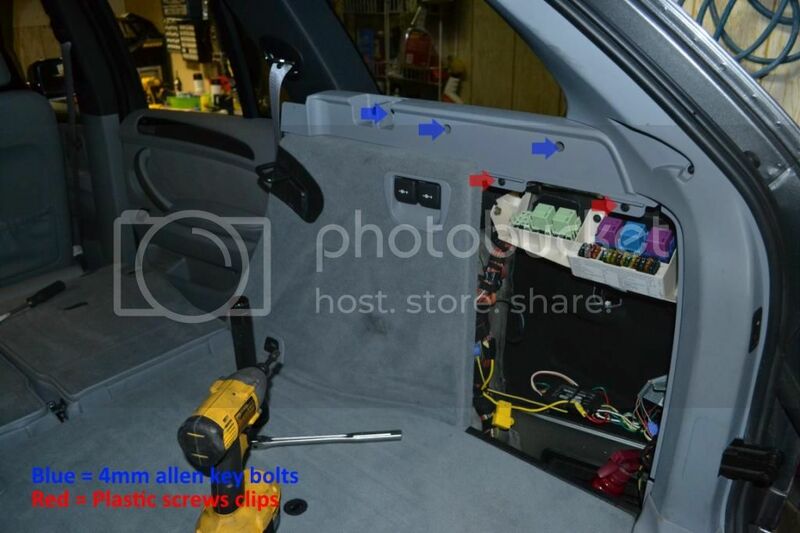 There are wiring slits (shown below right) in the carpet you can utilize to pass the wires from under the carpet to around the center console. 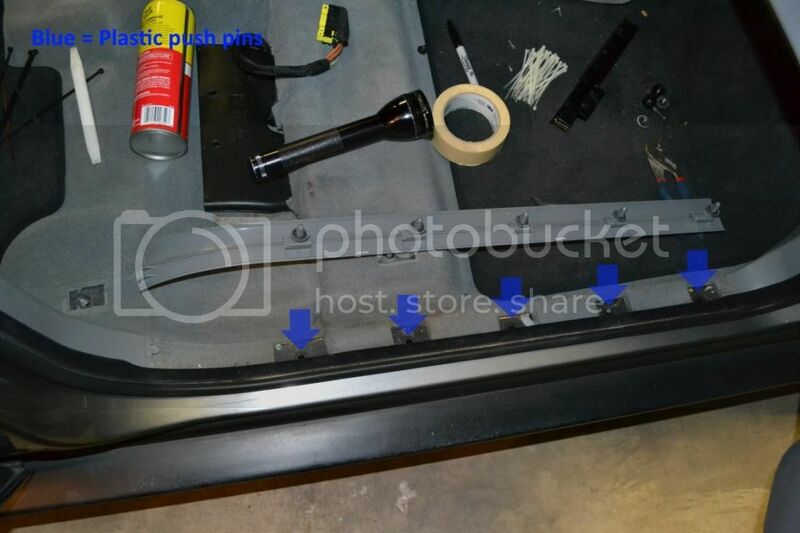 You can now reinstall the wire cover, B pillar, and door sills. 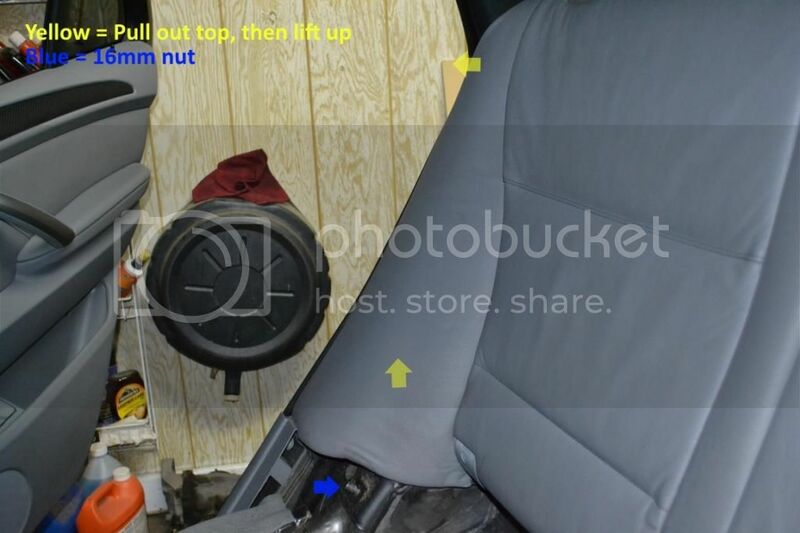 You can also now install all of the interior up to the bottom seat cushion. Still, DO NOT connect the battery. 56. 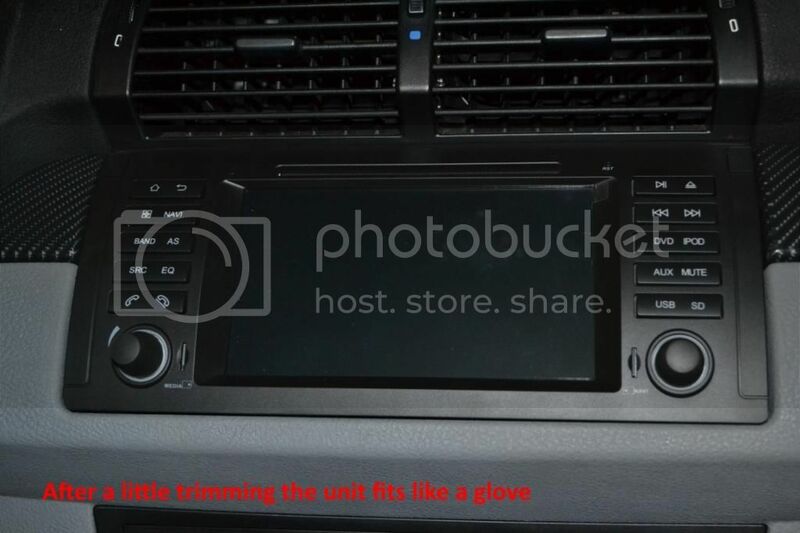 Remove the factory head unit now by prying the trim that goes around it with a panel tool. Then remove (4) T10 torx screws. Unplug/remove nav screen and push out the climate control console from behind. Unplug/remove climate controls to give you easy access to run wires up and into the radio area. You should have the Fakra cable, antenna cable, and backup cam video signal cable + trigger wire. 57. Now you can install the peripherals: USB/Ipod cable, Aux video/audio/USB cable (if installing), external mic (if installing), and GPS antenna. You may choose to put these things in different places than I, but this guide will show my locations. Drop the glove box (6) phillips screws. Two of these are "hidden" and can only be accessed after removing the pin holding the shock to the glove box and pulling the right side in to clear the stop. Looking from below you can now see the final two screws. You will probably have to remove the light inside the glove box as well before it will drop. Installing the aux video/USB cable in the rear lighter location simply involves removing the lighter and opening the hole up a bit to fit the new accessory. 58. I installed my USB/Ipod combo cable in the glove box which requires nothing special. Just route it out of the glove box and around the back to the radio area. Installing the GPS antenna and external mic requires pulling the A pillar. There is (1) T25 screw behind the SRS trim and (3) clips holding it in. Pull the door weather stripping and it will come out. Running the plugs down can be tricky but with patience can be accomplished. 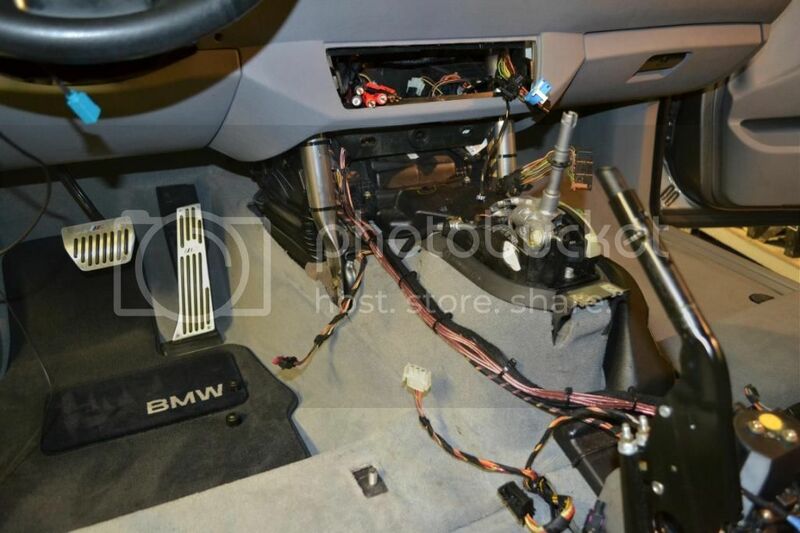 after getting the plugs down, routing them behind the glove box, and up into the stereo area. Now you can run the rest along the factory wires up the pillar. Important: Do this to keep them out of the way of the air bag. 59. Go ahead and reinstall the glove box now as we won't need access back there again. You can also reinstall the center console now. 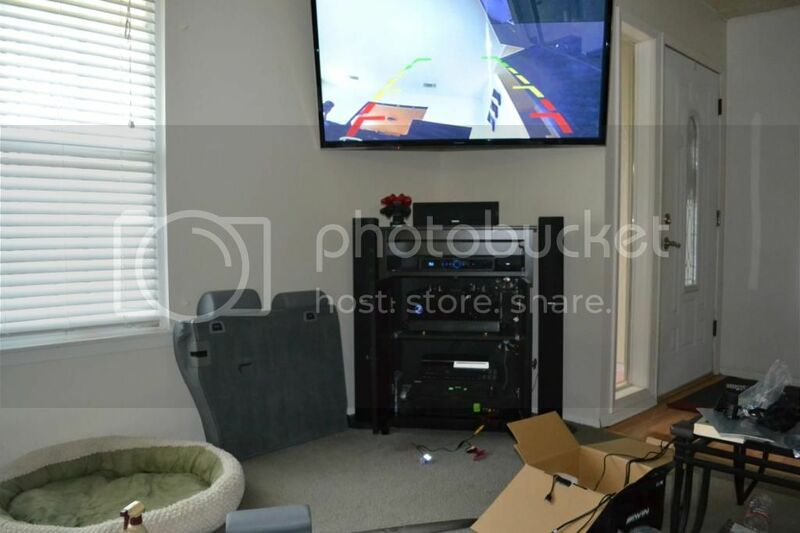 If you chose this as an area for accessories, run the wires for them while installing the console. 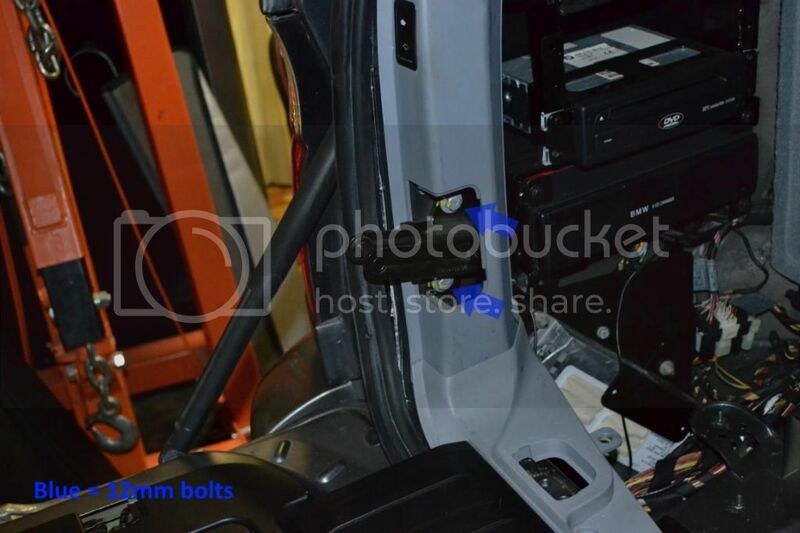 I installed an aux USB/video plug in the rear lighter location as pictured in step 57. Go ahead and install the front seats after the center console is fully installed. Almost looks like a complete vehicle again. 60. 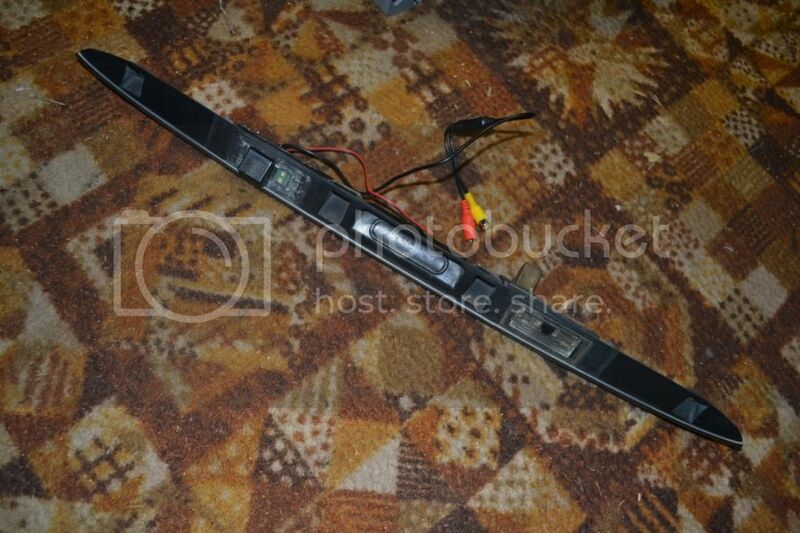 Remove the overhead vanity light console by popping the courtesy lights out with a plastic panel popper. Sometime the metal clips for these are bent in the front and get stuck. Just pull harder and it will come down so you can re-bend the clips to their proper shape. Pop out the homelink panel and then reach behind to remove the front console (mine is the ultrasonic alarm, yours may differ). Now drop the console itself after removing (4) T10 screws. Remove the factory microphone (if equipped) or grille so you can modify to fit the external mic. 61. Remove the passenger vanity mirror. (4) T20 screws are hidden under panels at the visor clip and at the swivel. Just pry those out to expose the screws. Disconnect the harness. Dropping these pieces allows the head liner to flex down enough to run wires and fit the mic and antenna in. Run the wires behind the head liner. I installed the nav antenna to the roof itself (upside down) and the mic to the factory mic location. Modify the factory mic grille to accept the new mic. I chose to drill a hole and super glue the mic mount to the factory unit in the back. Makes for a fairly clean install. Would have preferred something that sat behind the factory grille, but did not want to sacrifice performance. 62. 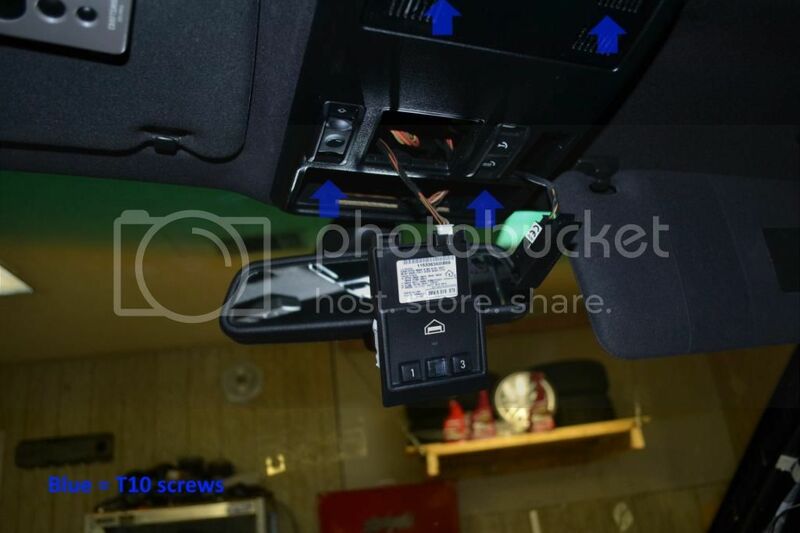 Reinstall the vanity mirror, upper console, pillar trim, and climate controls. Install is almost complete. 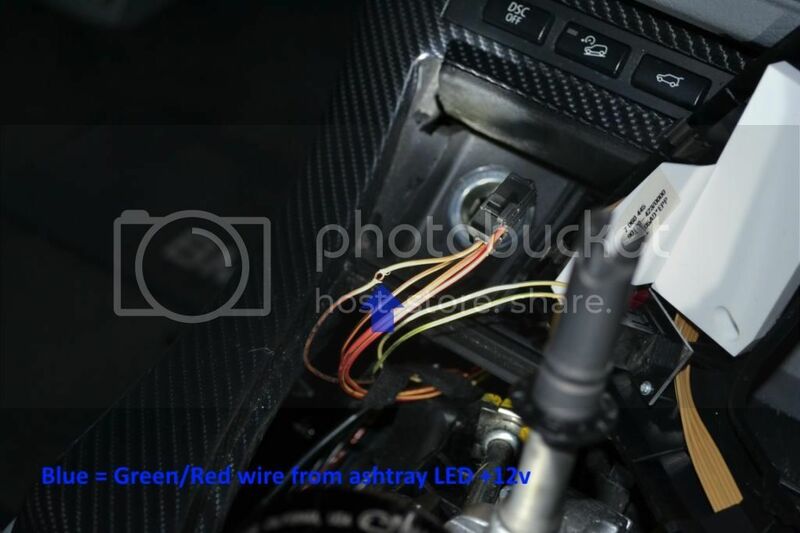 In the blue plug that was attached to the factory nav there should be a Grey/Red wire that controls illumination. I cannot confirm this as I used the cig lighter Green/Red wire shown below. I learned about the Grey/Red wire after my installation was complete. It's certainly easier to get to than my solution which is why I am mentioning it here. Tap into one of those wires of your choosing for illumination control. Also notice my heat shrink on RCA connectors. I do this to prevent them from pulling out but is not necessary. Connect all of your other wires to the unit and slide it in as far as it will go... it won't fit, the bottom is square and not round like it needs to be. Don't get pissed and break something (like I was tempted to do)... we'll get back to that in a moment. 63. Finally, go to the cargo area, connect the battery, and reinstall all the associated pieces. Go ahead and put the cargo floor back in as well. We should be done back here. Now put your key in the ignition and test your unit on key pos 1. Note: upon starting the car the 4x4 warning light will illuminate. It will go out after driving a short distance. Your Avin unit should boot up. If you switch the lights on you should have illumination. Test that everything sounds good, radio, USB, etc. If all is good move on to the final step. 64. Now that we know everything works, grab your dremel or tool of choice for grinding. I used a small cone shaped grinding stone on my dremel for this. 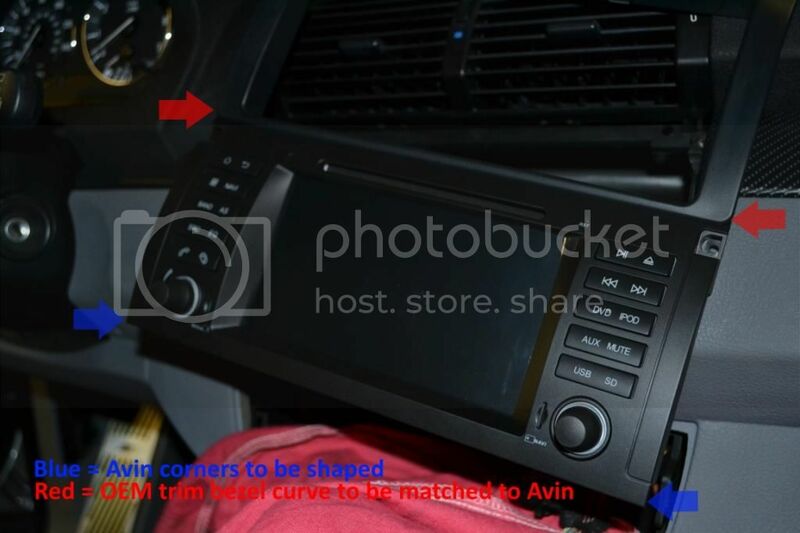 You have to reshape the Avin's lower corners to match the old trim that used to surround your nav unit. Go slow and remember you can always take more off, you can't add any back on. Just take your time and do a bunch of test fits. With a little work (took me 10 mins) you will have a nice radius on both sides and the unit should slide in nicely. It will be a snug fit... which is good in my book. 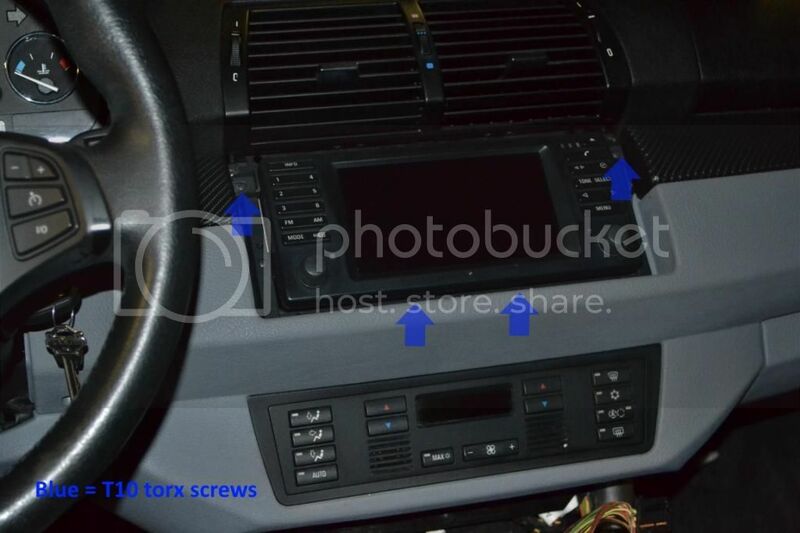 You only need to secure it with the top (2) T10 screws from the original head unit. 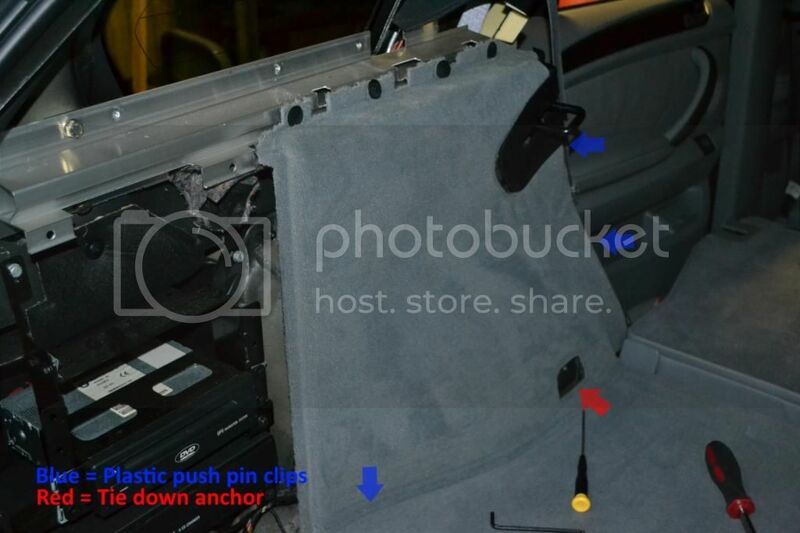 Before securing it permanently do a little wire management behind the radio with zip ties just to clean things up. 65. Crack open a beer, or 12 and start playing with your new head unit. If you made it this far congratulations, the picture below no longer scares you and you know your vehicle more intimately. If you are a non-factory navigation reader your life will be much simpler unless you are installing a reverse camera. Hopefully portions of this guide will still help you out as well. Feel free to drop me a line on www.xoutpost.com to user crystalworks if you have any questions. So far my wife and I absolutely love this unit. We have not had time to play with it fully yet though so I am reserving a full review until we've lived with it for at least a few months. Look for that in the future. This is a huge leap forward in terms of sheer technology (and enjoyment) for our X5 which we are hoping will last us a very long time. If I have to swap another motor into it I will... as I really enjoy driving it. Is the unit "Plug and Play?" Maybe in the strictest sense of the phrase it is... but having to modify the front bezel to fit doesn't fit that definition to me. Also the reverse camera AvinUSA markets as for the E53 does not fit in any way shape or form. It is definitely NOT for this chassis. Other than those two gripes, which are very minor to me (I was a professional installer) the unit installed without much problem. It took a lot of time, but I went into it expecting that just because of the way I do installations. You could probably throw this thing in on a weekend if you install it like normal people. Would I do it again? Absolutely. The quality of the unit seems good so far and the OEM looks are absolutely key to my wife and I. The screen looks beautiful and boasts a pretty impressive resolution. The external mic picked up conversations well and no one reports having a hard time hearing me. The UI and Android ecosystem are going to take some getting used to as a head unit. Not in a bad way, it's just very different than working with something on a traditional mobile electronics platform. The dual core processor seems to handle Kit Kat just fine with no real lag. I have not tried running a bunch of android apps at the same time though. Lastly, and possibly most importantly with a unit like this, Tommy seems to be VERY good with customer service and support. He has already sent me a software upgrade and answered tons of questions I had before purchasing. Support is key in my book and so far am very pleased. As I said, if you have any questions drop me a line on www.xoutpost.com as user crystalworks. Last edited by crystalworks; 01-03-2015 at 02:02 PM. Reserved #3... Will place review of the unit here after living with it for a few months or so. The new Dynavin N6 is plug and play and now it's DSP compatible, great write up. Great write up. It's not easy doing it right but you went all out! Extra impressed that you took the time to put the guide together. I had to work through a lot of these issues also, and this would have been a huge help. P.s. I have asked Jeff to remove the 'E53' camera from his website. Hopefully your source does the same. The camera is for an e39/e46 - such a shame not for ours. Also. Aside from it not fitting - why wouldn't these use a 4 pin micro connector?! Those huge RCA's are a PITA to get through the tail gate as you know!! Thank you for doing the write up. That is a bit disheartening about it not fitting perfectly. Did you bring it up with them? I wouldn't want to have to take a dremel to my brand new $700 unit. Thanks. The Dynavin is a really nice unit but faces many of the same install challenges as the Avin when talking about replacing a factory nav unit. The only glaring difference is the necessary trimming on the corners. I agree Josh. I was surprised to see that it was necessary but have not mentioned it yet except in the DIY. I sent a copy to Tommy so I'm sure he'll review it. Will follow up with him. Thanks... my head still hurts from reading, writing, editing, and diagrams. Took a week to get it done... but it turned out pretty nicely (I think). We'll see if this thread sees any traffic or helps anyone. I hope it does, but time will tell. Subscribed - awesome write up! Solid - Welcome to the "Updated" club. So much nicer it makes you wonder why you didn't do it sooner huh. HA.